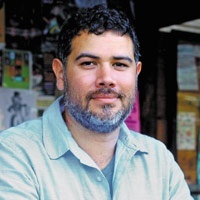 Manuel Gonzales (author of The Miniature Wife and the judge for The Conium Review‘s Innovative Short Fiction Contest) will be reading at a Riverhead Books event during AWP. Since its founding, Riverhead Books has published the freshest, most memorable and diverse new voices in literary fiction. Riverhead authors have won Pulitzer Prizes, National Book Critics Circle Awards, Story Prizes, and been named to Granta’s Best of Young British Novelists, the National Book Foundation’s 5 Under 35, and the New Yorker’s 20 Under 40, among many other distinctions. Four of Riverhead’s acclaimed writers will read and discuss their work with Riverhead’s director of publicity. The other readers are Nami Mun (author of Miles from Nowhere), Danielle Evans (author of Before You Suffocate Your Own Fool Self), and The Train to Lo Wu and Nobody Ever Gets Lost). Jynne Dilling Martin moderates this session.